Althalus is a young thief and occasional killer known for his skill and incredible luck. A number of capers end without much monetary reward for him, until he stumbles into a shrine built to the fertility goddess Dweia. Soon afterward he meets with the wizard Ghend, who hires him to steal the Book, a magical tome that can be found in the bizarre House at the End of the World. There, Althalus discovers Dweia in the form of a black cat and learns that she has chosen him to aid her in a war against Ghend and her evil brother, the destroyer god Daeva. Together Althalus and Dweia use the power of the Book and gather together a small team of questionable heroes who must battle Ghend’s supernatural forces and armies. The thief Althalus can only hope his luck holds out for this one last task, since the very fate of humanity is at stake (goodreads.com). 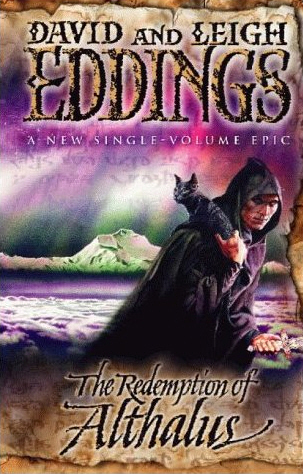 The Redeption of Althalus is the first book I read by the Eddingses. Supposedly their books are good, but I found this one to be boring.This is over a 700 page book, and by page 520 I decided I just couldn’t read it anymore. I can’t believe I even read that far into it. I found that the story was predictable and formulaic, which usually doesn’t bother me, but in this case it became really boring with the addition of long, drawn out, detailed explanations of battle tactics. I like reading about battles and such, but I don’t need this much detail behind it. The battles were also uninteresting and you have a pretty good idea who is going to win within a page or two. Additionally, throughout the novel there weren’t any surprises or twists in the story, so there was nothing to keep me intrigued. I don’t know why I even read as much as I did. I guess I figured it would get better. The plot really did have potential and their were some interesting aspects to the book, but it was just poorly executed. What I did like about the book was the lack of detailed violence. The characters were also one-dimensional and uninteresting. What I didn’t like were the descriptions of the characters. All the women on the good side were beautiful, the one woman on the bad side was ugly, and this seemed to be the same for the men. The fat characters were slow and lazy and the skinny characters were athletic. There wasn’t any variation. I didn’t really come to like any of them or think of them people. None of the characters had any difficulty completing their tasks or coming up with and executing ideas. They just weren’t real. I also did not particularly like some of the dialog between the characters. Calling someone “pet” is just a little strange. There was also a bit of repetition with the dialog and storytelling. I would recommend this book for young adults because its not as graphic as many other adult fantasy novels. The writing was also good with few to no errors. As previously mentioned, the plot did have some interesting aspects and their was definitely potential for a better story. I think this book would be more enjoyable for young adults who haven’t read much fantasy or to people who really like reading about battles. Otherwise, I wouldn’t waste any time reading this book. Hmm. I might have to give some of his other one a try then. Thanks for letting me know! Otherwise, I may not have read any of his other books.